Gardeners love tulips, lilies, and pansies—the common, but beautiful, plants found in the average garden. But there are realms in the plant world far beyond these familiar favorites. In Bizarre Botanicals, plant experts Larry Mellichamp and Paula Gross take readers on a curious botanical journey of weirdly wonderful plants that can be grown at home. 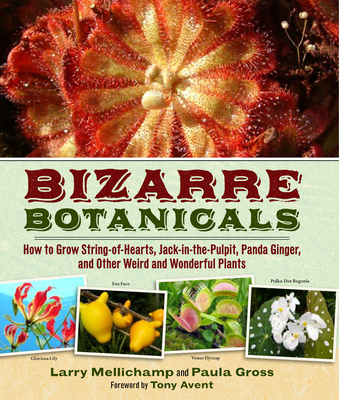 Bizarre Botanicals features over 75 astonishing plants that have extraordinary abilities—from pyrotechnic spores that can burst into flame when ignited to flowers that lure insects to their deaths. Each plant profile includes essential care and cultivation information. A difficulty scale alerts gardeners to how easy (or difficult) it is to grow the plant at home. Larry Mellichamp teaches botany at the University of North Carolina at Charlotte and was director of the University’s botanical gardens. He has appeared regularly in various media and received several teaching awards including the B. W. Wells Award from the North Carolina Native Plant Society and the Tom Dodd Jr. Award of Excellence.